Former Nomi Lackee Reservation. Photo: Bob Dawson/ Farewell, Promised Land Project, 1995. "As there is no further west, to which they can be removed, the General Government and the people of California appear to have left but one alternative in relation to these remnants of once numerous and powerful tribes: extermination or domestication." The Indian commissioners, who were appointed by President Fillmore in 1850, negotiated 18 major treaties with approximately half the tribes to give them 8.5 million acres of land, but these agreements were rejected by the federal Senate despite the fact that this only about 12 percent of the land that had been left to them by the previous Mexican government. Meanwhile frequent raids by starving tribes on mining camps and ranches was leading to skirmishes. When the militia failed to wipe out the resistance, as described in the previous pages, the federal government decided that there was only one way to contain the rebellious natives, and that was by persuading them to move to a system of reservations where they would get government support and protection from the roving militia. Edward Beale and Thomas Henley were the chief designers of this plan. In retrospect, Fred Pikley, attorney general of California, observed dryly that Washington "exerted itself to chose those agents who possessed the greatest ability to advance their own interests by robbing the Indians and who were most utterly destitute of any feeling of humanity." Beale took pride in his work to dispossess the communities as may be discerned from the two following remarks to his bosses. "(T)his fact alone is better than all the explanations I could give you of the inferior quality of land I have selected ... every settler passing ... has left as unworthy his labor, the tract I have indicated," to explain why he chose to set up his first reservation at Tejon pass. "You will also observe that I have not made either treaties, or Indian reservations, nor do I propose to do so. I ask that this land be set aside as a Government reservation, so that the Indians holding it by no other title, but by the will of the Government, may at any time be removed at its pleasure." Beale was replaced with Henley who also took pleasure in treating the Indians badly. He adopted a policy to refuse to help any Native person who would not come to the reservations. "I regard the policy of feeding those who refuse to go to the reserves as injurious to the policy of colonization as contemplated by the system now in operation," he wrote in 1855.
Henley was aware of the consequences of this policy. "Though it must be admitted that the Indians suffer immensely, and hundreds die every winter from actual starvation, I am still of the opinion that any attempt to feed them in their Rancheria would be attended with a heavy expense," he wrote of the Achomawi. The Achomawi and northeastern Maidu who agreed to be relocated were driven to Round Valley in Mendocino County in 1860. "The removal has taken two weeks and of the 461 Indians who began this miserable trek, only 277 have come to Round Valley. Many died as follows: Men were shot who tried to escape. The sick, or old, or women with children were speared if they could not keep up, bayonets being used to conserve ammunition. Babies were also killed, taken by the feet and swung against trees or rocks to crack their skulls." Once at the reservations, the food and supplies provided were barely adequate. At the Round Valley reservation, they were given a daily ration of three ears of corn. Henley boasted that he was able to feed individuals on 4.5 cents a day noting proudly that he never gave out beef if he could help it. Nor was this the only reservation with a history of forced resettlement. 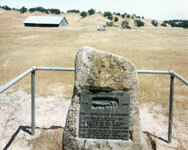 For example Yokuts were driven to the Fresno reservation and their villages burned behind them. J. Ross Browne, a federal Treasury official, was asked to investigate the conditions on the reservations. In an article he later wrote for Harper's magazine, he noted sarcastically that the blankets provided to the people were extremely thin. "By holding his blanket to the light an Indian could enjoy the contemplation of both sides of it at the same time; and it would require a little instruction in architecture to enable him to use it as a window to his wigwam." The reservations were set up with utter disregard for tribal differences. Thus the Wiyot in the northwest were sent to Smith river where they were met with hostility by the local tribes, the Modoc were sent to cohabit with their longtime enemies, the Klamath. This policy led to a major battle between the United States troops when the Modoc left the reservations and retreated to the lava beds in eastern Siskiyou County. There the Modoc performed the Ghost Dance, a popular religious revival that began with the Numa and swept through Western tribes, to prepare to wrest their lands back. Federal agents also regularly redrew maps when settlers requested lands allotted for the reservations and systematically moved the Native peoples to poorer lands. In a cruel twist in 1890, directly after the army captain at the Hupa reservation reported that gold had been found and that the presence of troops was necessary to prevent a new Gold Rush, the Commissioner of Indian Affairs asked the Secretary of the Interior for the troops to be withdrawn. The request was granted. Browne summed up his observation of the reservation system in the 1850s as follows: "A very large amount of money was annually expended in feeding white men and starving Indians ... In the brief period of six years they have been nearly destroyed by the ... government. What neglect, starvation and disease have not been done, has been achieved by the co-operation of the white settlers in the great work of extermination." Deliberate massacres, slavery, child prostitution, racism, a system of reservations that starved people to death, made survival of the first peoples of California almost impossible. That any survived is a testimony to their courage and strength as peoples. Unfortunately, as we will see in the second half of this report, those that have survived have inherited ruined lands that will continue to plague the coming generations.